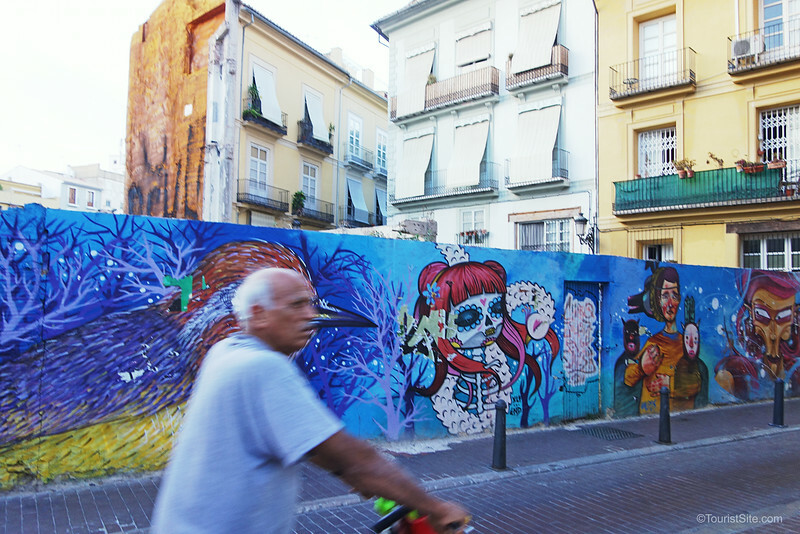 Valencia was the first stop of our Spanish road trip, and we didn’t really have any preconceived ideas about the city beyond oranges and paella. What we found was a very unique medieval and modern city, with an abundance of street art that gives a fresh twist to exploring its old town. Overshadowed by Madrid and Barcelona, Valencia is the third largest city in Spain with a population of about 800,000. It has a fascinating historical center with a labyrinthe of cobbled streets that is very walkable or great to tour by bike. You will notice that Valencia was hit hard by war, and next to intact or restored buildings are ruins and vacant spots often walled off for future development or restoration. These blank walls have become a canvas for a variety of street artists, and the combination of their art with historical architecture leads to a surprise around every corner. Valencia is a city of contrast. I think he looks like Picasso surveying the scene. 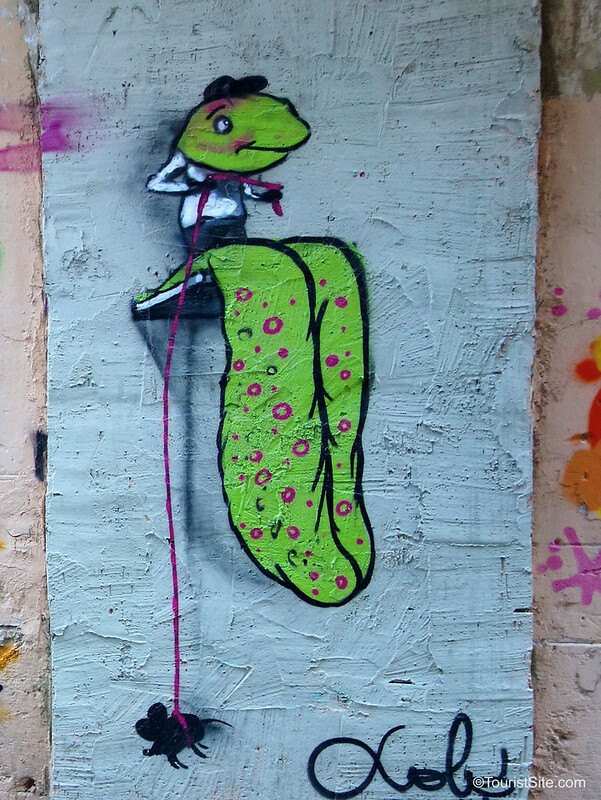 Street art – love it or hate it? Which is your favorite? I adore street art. I’m going to have to put Valencia on our bucket list. I’m sure you would love it then. It’s one of my favourite cities. Great collections of pictures! No one really thinks twice about the artwork that is all around us. Great to see the culture of the city in a different unique way! Thanks for checking them out Sanjana! I agree with others street art can be amazing and should not be confused with graffiti which we hate! We think that many other towns and cities get missed by many people who for some reason or another tend to stick with just the capitals or high tourist areas. Although we enjoy seeing places like those we much prefer places that may not be so popular. Glad you have been enjoying the city of Valencia. One day we to will make it here. I’m sure you will enjoy it when you do. I agree it’s nice to get off the beaten path especially to see the smaller towns and villages. great city.my eyez are glued to de art.my community in ghana need such thing…we have the finest festivals here tooo and i will luv your camera doing this same projection. I’m glad you enjoyed the art. Thanks for your visit! 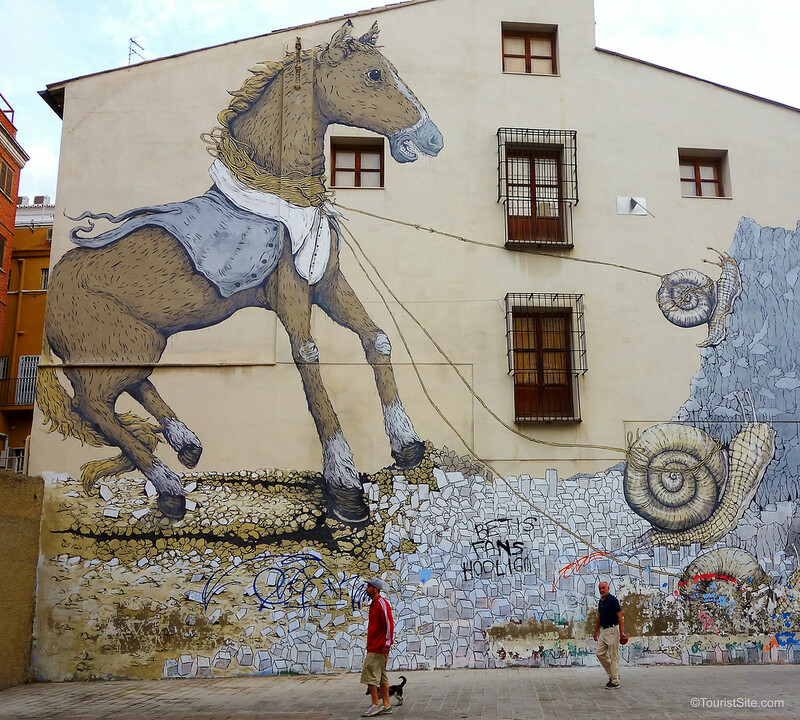 True, and I wouldn’t want to see street art on Spain’s beautiful historical buildings (or modern ones for that matter). 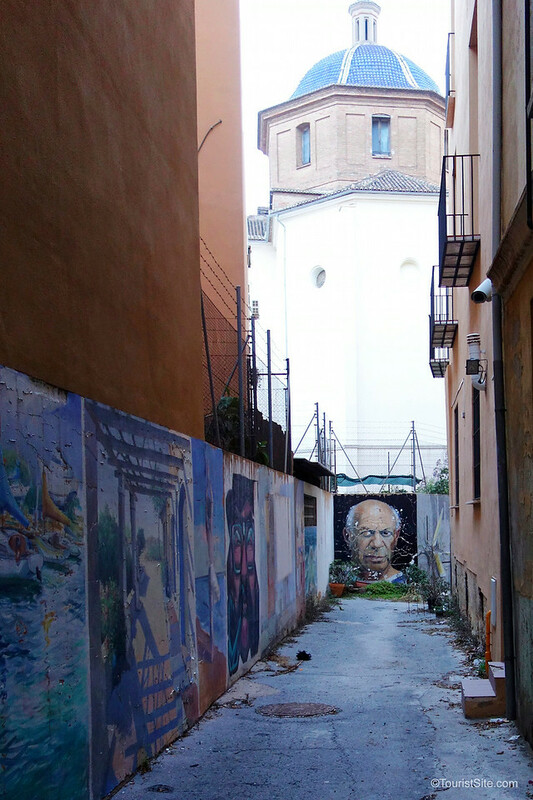 In Valencia the artists seem to confine their work to empty concrete walls and construction barriers, so maybe that’s why the officials turn a blind eye and allow the art to stay. Certainly some talent here. 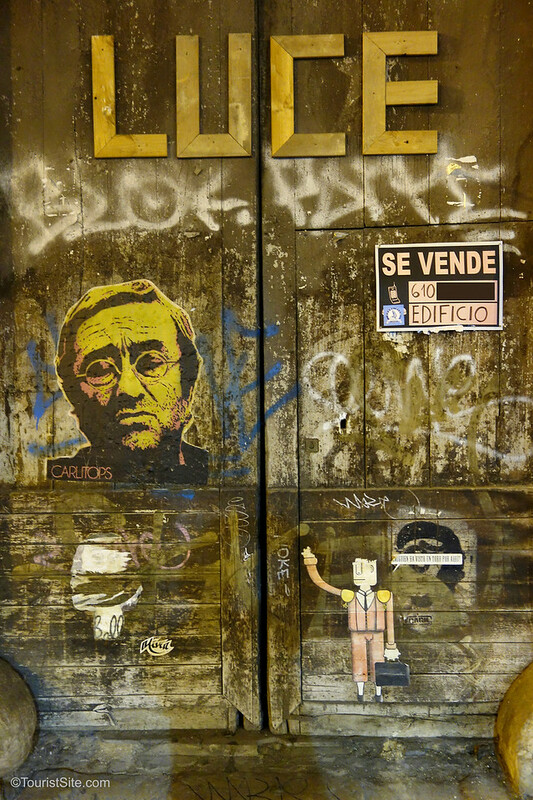 I’d say Valencia’s street art might rival the quality and quantity seen in Berlin. 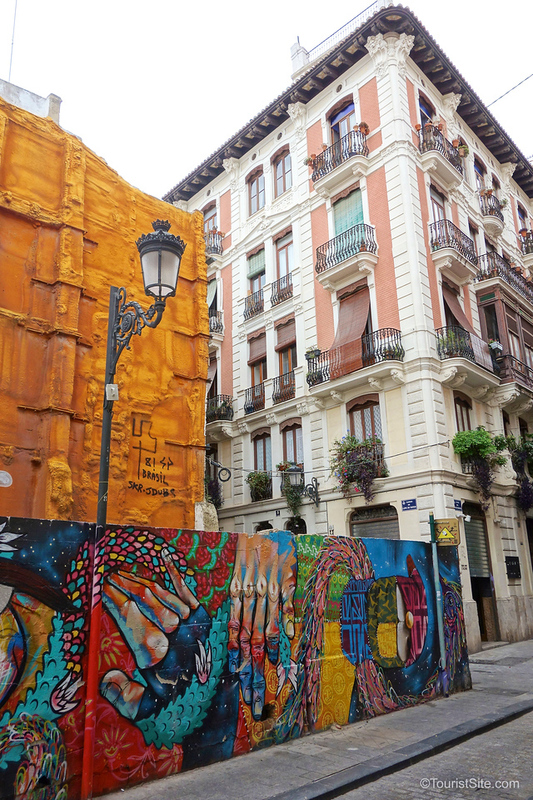 Your pictures are great, but must admit it changes what I used to admire about Spanish cities. A case of, if you can’t beat ’em join ’em, I guess. I normally do not like anything resembling graffiti, but this is not. This truly is art and I love it as well as your photos! I agree Michelle. I don’t like graffiti that is tagging and defacing property but I do appreciate this art! I love street art (not graffiti). 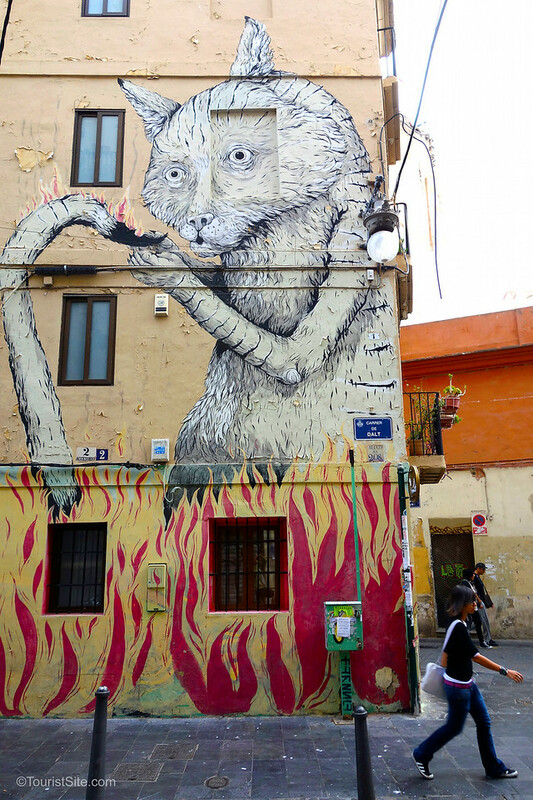 Street art in Valencia looks wonderful. Some very complex pieces and high quality pieces. Some of this art must have taken some time to accomplish! Great photos! I always enjoy seeing the street art in cities we visit. Did you just happen to find all of these or were you guided? I was in Valencia briefly and seem to have missed it all, too. We were just touring on our own, one day walking and then next by bike. 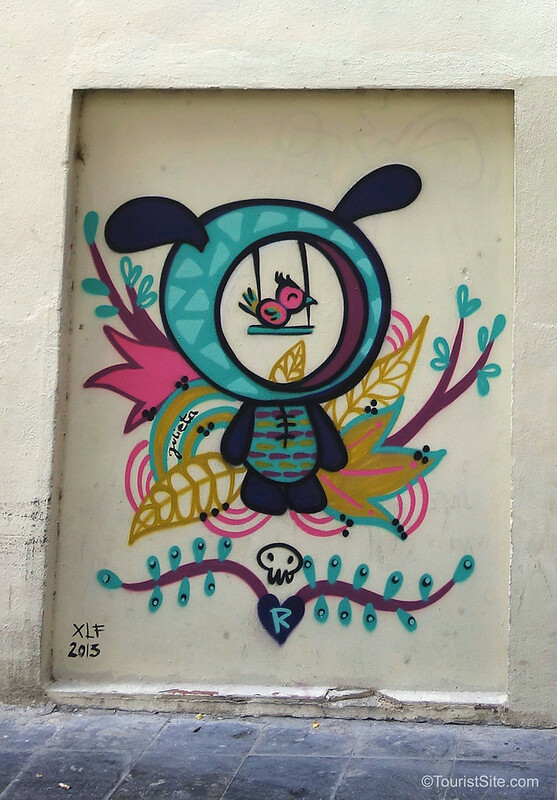 But once we noticed the street art we went looking for it, down smaller streets and alleys. Wow, it’s like the city is one big gallery. Fantastic! Thanks Carole. Glad you enjoyed it! 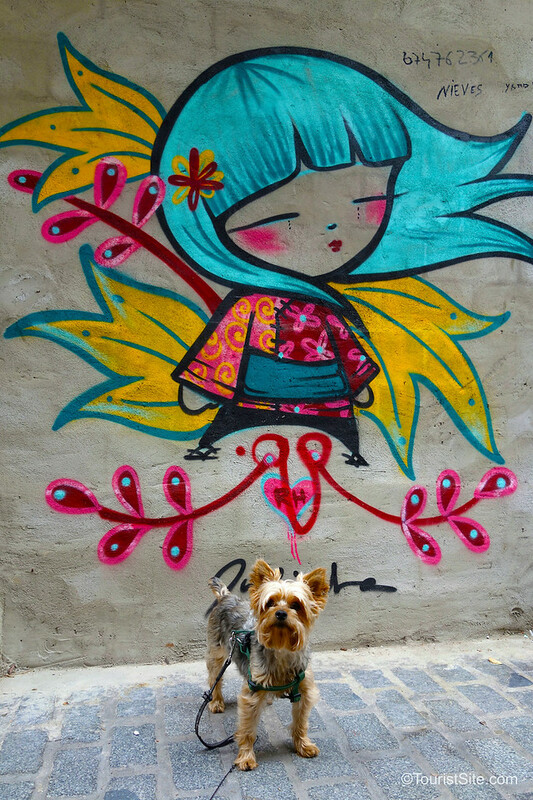 Great photos Shelley you really captured the street art of Valencia. My fave was the shot of Winston enjoying the art! 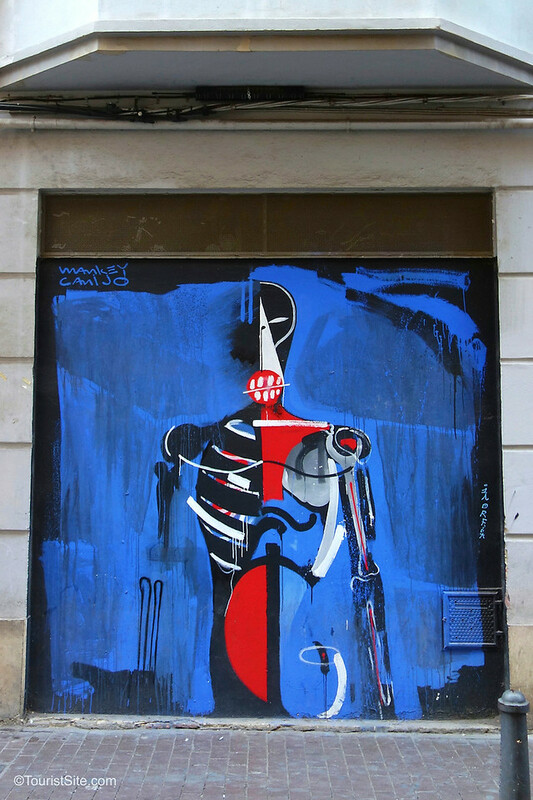 I’m always fascinated by street art – you managed to capture such a good variety of styles! I’m glad that street art is slowly gaining some credibility and is now globally an accepted form of art (not to be confused with rough graffiti). Thank you Juergen! Some of these street artists are really amazing! It’s great to see art amongst the people rather than confined to galleries and museums (although I enjoy those too). 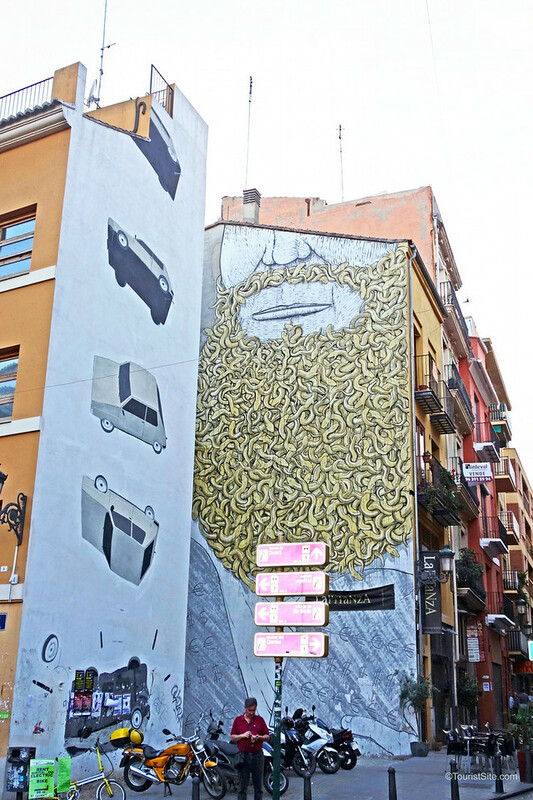 Wow, we were in Valencia during the Fallas and there were so many people that I completely missed seeing the street art. How wonderful it is! I’d love to return and spend more time exploring its fascinating streets and cuisine. It must have been awesome to be in Valencia during the Fallas! We need to return to sample some good paella. The one place we tried it was in a touristy area, and it was pretty bad. But I’m sure it wasn’t a good representation of their local dish. We had great tapas though! It is amazing how an artist can create anywhere; their canvas any vertical space. Your photos are so vibrant and interesting! Your photos certainly show high quality street art. I don’t love graffiti that is little more than “marking”, but the street art you photographed clearly isn’t that. It also returns life and vibrancy to walls desecrated by war. (The Spanish Civil War?) I’m from Philadelphia, Pennsylvania in the USA. 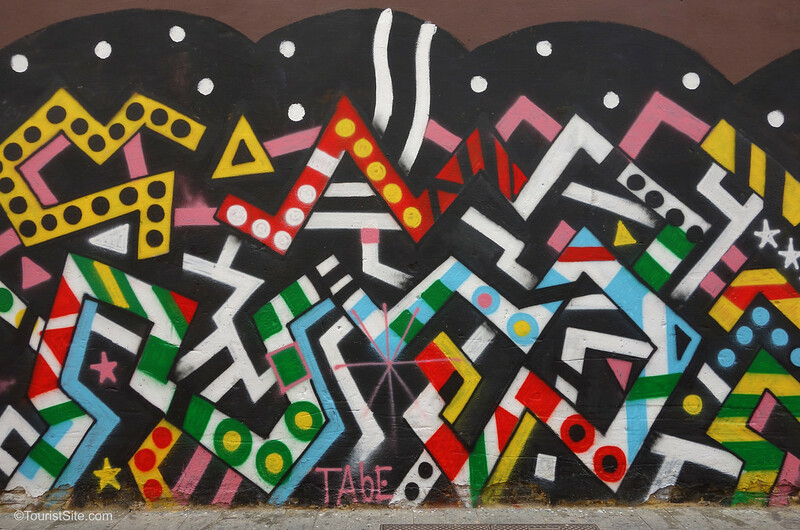 The city has a Mural Arts Program dedicated to producing murals painted by community members under the supervision of a mural artist on walls all over the city—-from the ritziest neighborhoods to the most blighted. If you ever visit Philadelphia, there are several mural arts tours that cover different parts of the city. Philadelphia also requires that developers of new buildings devote at least 1% of the price of construction to providing public art. Good comments Suzanne. 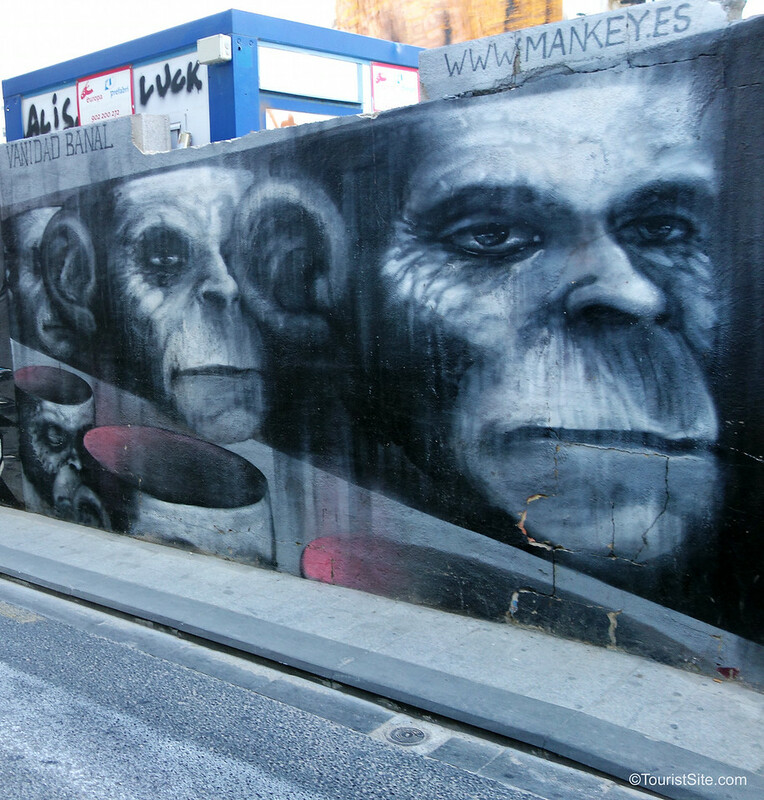 I’m going to look further into how Valencia’s street art came into being. It’s great that Philadelphia has a city art program. 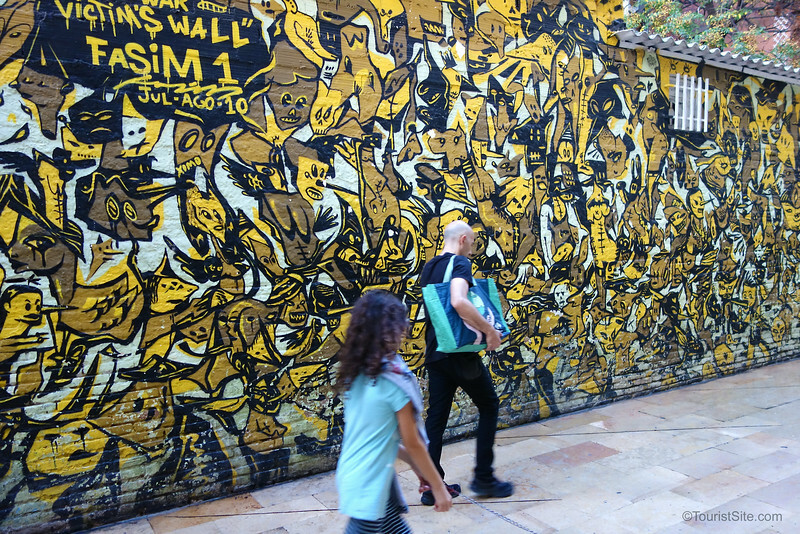 A mural tour would be a must see for me!